All new design. 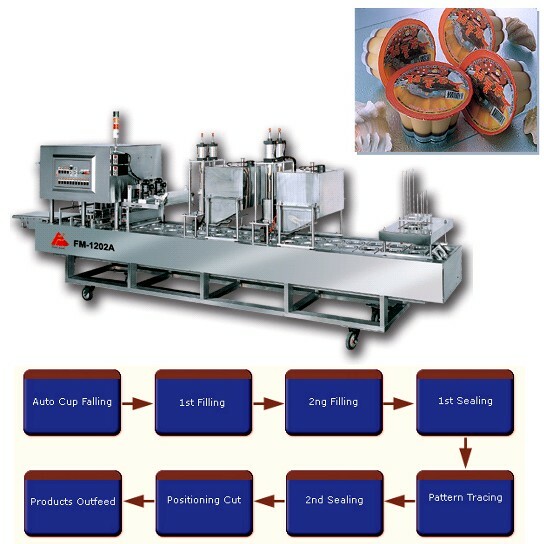 A packaging machine specially designed for pudding filling and sealing. A highly automated machine. The operation cycle, from cup falling, filling, sealing to product outfeed are fully automatically performed. It's a necessity in mass production line. Pudding, yogurt, ointment and soybean milk. * Two-step piston filling device permits adjustment of filling quantity. * Independent temperature control on each mold. The lamp lights up if a malfunction occurs in the heating system. * Stainless steel sealing knife for rust-free performance. * Waste film can be collected automatically. * The machine is constructed of stainless steel to meet sanitation standards. * CIP automatic pipe washing. * Outfeed conveyor is available for delivering the finished products to the next processing equipment.